Heat oven to 450°F. Remove pie crust from pouch; unroll on work surface. Cut into 4 (4-inch) triangles. Place triangles and trimmings on ungreased cookie sheet. Brush with butter. Sprinkle with sugar and cinnamon. Bake 8 to 9 minutes or until golden brown. Cool. Meanwhile, in blender, place 2 cups of the ice cream, 1/4 cup of the milk and 1 cup of the blackberries. Cover; blend on medium-high speed about 1 minute or until smooth. Pour into 2 glasses. Repeat with remaining 2 cups ice cream, 1/4 cup milk and 1 cup blackberries. 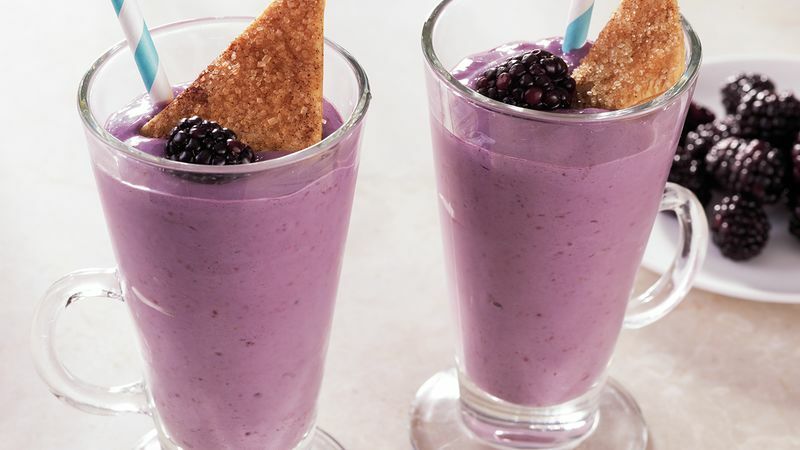 Top each shake with 1 pie crust triangle; garnish with additional blackberries. Store remaining pie crust pieces in tightly covered container and reserve for another use.